My favorite line to repeat from this story arc has still been "You got that ick?" It just sounds like some nasty disease that people are passing around for fun. To be honest, I wasn't very enthused about any of the books that I read this past week. 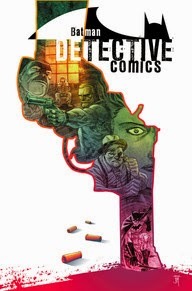 Detective Comics #33 made the cut for my Pick of the Week mainly because of the artwork. I like the cover and seeing the sketches and art processes at the back of the book a lot. I like how in the rough sketch ideas for the cover, one of the versions shows the back of the leader of the gang. I like that because it spells out the gang's name on the jacket so you can identify who the character is and the specific tie-in to the story, whereas in the final version the jacket is obscured and the villains seem like any joe crooks (especially if you are picking up this story without reading any of the previous issues). The silhouette against the white background stands out nicely compared to the other versions like the one that featured the various elements across the entire page. It gives the design focus. There's something about the silhouette though which looks like the outline of a state, and it's strange yet interesting the way the two-dimensional aspect of the silhouette comes between the bullets and blood and the characters which have relatively more depth. As to the story itself, I feel like I'm still waiting for more head-way to be made regarding Icarus and I'm waiting to see who will be the one to stop it. Whether that's Batman or the Gotham police. Or more likely Batman will take down the production of Icarus and then the police will attempt to take down Batman. This issue does end with a confrontation between Detective Bullock and Batman. The story is somewhat interesting so far but I'll get bored pretty quickly if all this comic has to offer is pretty artwork. So far, it's doing all right but we'll have to wait and see what comes next.